Last week Greg over at Pie-ence was talking about the amazing variety of vegetable crops breed out of a handful of species within the genus Brassica, specifically Brassica rapa and Brassica oleracea. * I’m referring to these as cruciferous vegetables, which is actually a wider category including all the vegetables within the mustard family of plants (scientifically this is called the Brassicaceae). But one of the cool things about having so many kinds of vegetables within the same couple of species is that, because they’re the same species, they can still be interbreed with each other to create “new”** vegetables. 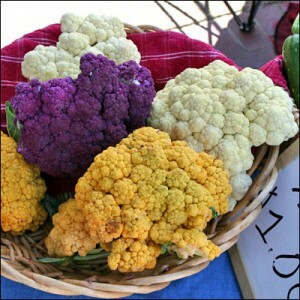 I still remember the first time I saw such a new vegetables, the broccoflower***. 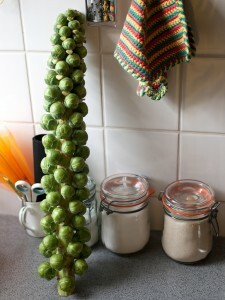 I didn’t even LIKE vegetables back then but I was still fascinated by this strange new plant in the produce aisle. Needless to say, others didn’t share my excitement as the broccoflower did not, in fact end up taking the world by storm (I’m not bitter! ), although I do still spot them from time to time at the grocery store. I was able to dig up this very enthusiastic article on the broccoflower from twenty years ago. The internet is a wonderful thing. Both the links in the above paragraph are to stories that also contain pictures of the flower sprout. I guess my point here is that plant breeders can produce all kinds of cool new vegetables given the chance. The limiting factor really is what people will buy, not the variability of plants. *Brassica oleracea is responsible for Broccoli, Brussels sprouts, Cabbage, Cauliflower, Collard Greens, Kale, and Kohlrabi. Brassica rapa is responsible for Bok choy, Komatsuna, Mizuna, Rapini, Chinese cabbage, and Turnips. And Brassica napus, a species that resulted from the hybridization of Brassica rapa and Bassica oleracea adds Rutabaga and Canola (not a vegetable, but a key crop none the less) to the count. **I’m putting new in quotes throughout this article because I don’t know what the actual definition of what makes vegetable different enough to qualify as a new type is. Since the effect of breaking this gene suggests to me that it is probably a recessive mutation (it won’t have an effect on the plant unless the plant inherits a broken copy from both parents) I imagine developing the broccoflower involved mating the offspring of a broccoli / cauliflower mating and mating them with normal cauliflowers again, since plants with one cauliflower and one broccoli parent should inherit a working copy of the CAL gene from their dad (or mom) the broccoli. But this last paragraph is purely my own speculation. Posted in: food, Genetics, Plant breeding, Plants. On another note ‘flower spout’? don’t get me wrong its really cool but that is the best name they could came up with? Dozens or hundreds or thousands of weird, but non-lethal, mutant phenotypes piled on top of each other seems like a reasonable explanation for how a couple of species have been bred to create such a wide range of forms. The ‘new’ crop I’d like to create is: vegetable arabidopsis! I know they have the mutants to make it into mini-cauliflower, I’m betting you could do cabbage and so forth pretty easily too. Wouldn’t they be cute little tiny vegetables? While I’m speaking about arabidopsis, whoever suggested to you that arabidopsis became a model due to lots of redundancy in the genome is wrong. 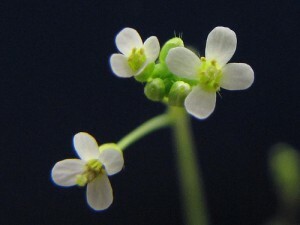 Arabidopsis has a TINY genome — which was a reason for it being a model — easy to sequence. Corn became a model just because it is an important crop, and probably because the bajillion transposons make mutation common. Redundancy in the genome actually makes genes much harder to study — because more mutants have no effect whatsoever. Tiny arabidopsis vegetables! I love it. Surely the importance of Arabidopsis can’t rest solely on having a sequenced genome. I’d at least include the floral dip method of plant transformation, being sexually self compatible and an incredibly short generation time to the list, although you’re right it probably didn’t become THE plant model system until it became the first plant to have its genome sequenced. As far as gene redundancy, I was picturing cases of partial subfunctionalization (the arabidopsis tetraploidy is tens of millions of years old) where there’s still enough over lap in function to moderate the effect of mutant phenotypes. But since no examples of this happening are coming to mind, I can’t make much of an argument for the point. Oh, I’m not suggesting the small genome size is the only reason — I think short generation time and small over all size are probably the biggest ones (floral dip transformation, I think, was discovered after it was well established as a model) my point was that a large, highly redundant genome would probably be an argument against being a model organism, not for. I agree with your point. This is why I’m in awe of the people who manage to do genetics in wheat. I just have two caveats related to the different between recent tetraploids (plants like wheat, potato and octoploid strawberries) and ancient ones (which, if you look far enough back, includes every plant genome sequenced so far). 1. An ancient tetraploid doesn’t necessarily have a large genome (relative to grape, arabidopsis has gone through two whole genome duplications, yet the grape genomes is ~3 times as big) and it certainly isn’t highly redundant. Very few genes get retained by chance over tens of millions of years in plants, generally if there are still two copies it is because there is a fitness cost of losing either one, either because the two genes have specialized in somewhat different functions and losing either one will make the plant less fit, or as a result of dosage (if the plant loses one copy of gene X or gene Y but still has two copies of the other gene the balance of X and Y is off causing problems and, presumably, reduced fitness). 2. Reading back over what I wrote, I see that it wasn’t clear that I wasn’t suggest that arabidopsis or maize became popular model systems because people knew the species were ancient tetraploids. For one thing I don’t know that anyone suspected arabidopsis was an ancient tetraploid back when it was first becoming popular. I meant to convey was that if ancient tetraploids have a higher incidence of interesting non-lethal mutant phenotypes when mutagenesis knocked out members of gene pairs retained for the reasons I mention above (pure conjecture), the result might be to attract interest in working with the system from more plant researchers (not knowing that the plant was an ancient tetraploid something that would make life complicated for genomics researchers when the genome was sequenced decades later), contributing to a species becoming a popular model system. My boss told me that at one of the recent plant molecular biology meetings, the salad on the final day of the conference included arabidopsis leaves. If I remember rightly from surveys 20+ years ago (some of which were published in a journal called Cruciferae Newsletter) Brassica juncea has even more different agromorphological forms that B rapa or B oleracea. For example B. oleracea never really produced any crop in which the root is the edible portion and B rapa lacks the sprout type and one or two other “oleracea” types while I think you can find some of these in B juncea. I didn’t know there were varieties of B juncea grown for their roots, clearly I’ve been neglecting indian mustard in my recent reading on the Brassicas. An oversight I’ll now be sure to correct. Thanks!